We all know it’s a good idea to keep up with blogs, right? There are blogs in our niche and blogs on marketing, social media, customer service and so on. I have a couple dozen or more blogs I like to keep up with but it can be hard to find the time to go through them all. Then there’s keeping an eye out for what people are saying about us, our company, our products and our employees online. Reputation monitoring is important but it’s another daily task that far too often never gets checked off the t0-do list. One way I’ve found to make both tasks easier is to setup a free ‘listening station’ using iGoogle. A listening station puts all the blogs I read, all my keyword alerts and any other searches I run on a regular basis, in one place. My listening station is now my home page, the first thing I see when I sit down at the computer to start my day. It’s a huge time-saver. Here’s how to get one up and running in less than an hour. You’ll need to login to your Google account (or create one). You’ll now see the defaul iGoogle page. It will have some ‘widgets’ already installed. If you any that you don’t want on the page, follow steps 1 and 2 in the diagram below. You can add several feeds to your home page but iGoogle also gives you the option of setting up multiple pages using tabs. So you could setup a tab for monitoring info on your company, one for marketing blogs, one for information specific to your industry and so on. 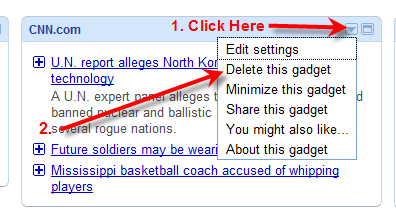 To add a tab, click where the (1) arrow is to open the dialog box, then click “Add a Tab”. If you were successful, you’ll see checkmark in yellow as in the image below. (Note: Quite often, you’ll get an error message saying “Feed Not Found”. Try clicking “Add” a second time. For some reason, it doesn’t always work the first time. If it fails a second time, try a third time or double-check you didn’t leave off part of the feed link. If you’re familiar with how to find RSS feeds for your favorite blogs and searches, you can go ahead and get started. On the other hand, if RSS feeds are fairly new to you, don’t worry. Tomorrow, I’ll take you through the steps of how to find and add RSS feeds. I’ll also give you a list of my favorite places to find top blogs in your niche as well as how to searches you’ll want to add to your listening station. In the meantime, have a peek at what a listening station might look like for someone that’s interested in the Mercedes S Class sedan. You can click on the image below to see a full-screen version. If you have any questions, please post a comment below and I’ll try to address them in tomorrow’s post. Thanks, Rebecca! I’m working on part II now.